The activities that make up our daily lives increasingly generate huge quantities of raw data, and running is no exception. When you haul yourself over the line in a marathon, log a run via an app or complete a parkrun, you’re generating data. Once the size of these repositories reach a certain mass you can start asking questions of the data they contain. The science of data analytics is driving innovations in predicting behaviour and identifying successful strategies – covering everything from selling us groceries, to traffic management and the treatment of disease. Barry Smyth is Professor of Computer Science at University College Dublin and works at the Insight Centre for Data Analytics. Usefully for us, he’s also a running fanatic. In recent years, alongside his academic research, he’s become intrigued by what data analytics might potentially tell us about how to run the perfect marathon. Having created huge data sets harvested from the tens of thousands of runners at marathons such as London, New York and Chicago, he believes it’s possible to not only better understand, but also to predict the behaviour of runners throughout the race. Motivational mantras, preferably overlaid onto a picture of a runner in a dramatic landscape, are ubiquitous on social media. That isn’t to say they don’t have their uses: I have a couple of things I mutter to myself when the going gets tough although they’re unsuitable for publication unfortunately. I don’t believe the no one-size-fits-all mantras work because every runner is unique and has their own motivations. This variety is reflected in the sheer breadth of organised events available to runners right now. 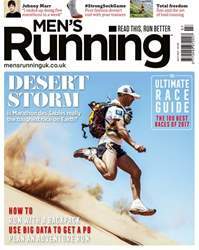 Which is why we’ve curated a list of 100 race (page 57) from both the UK and abroad, that we feel represents the scope of running for the remainder of 2017. From 10Ks to ultras, from road to trail, there’s something here for the beginner, veteran or just anyone who wants to simply try something new. Speaking of races The Marathon des Sables has been given the sobriquet of ‘toughest race on the planet’ so we felt duty bound to find out for ourselves if this claim is true. Our runner’s report (page 34) tells us that while ability is obviously essential, being able to get along with and support your fellow runners is the most important attribute required. Of course not every run has to be a race and there’s still satisfaction to be found in creating your own running adventures (page 21) or building goals from the reams of data floating around out there (page 42). Again it’s down to what individual runners want from their sport. All running together but with different destinations.